Background and objective The acceptability of financial incentives for organ donation is contentious. This study sought to determine (1) the acceptability of expense reimbursement or financial incentives by the general public, health professionals involved with organ donation and transplantation, and those with or affected by kidney disease and (2) for the public, whether financial incentives would alter their willingness to consider donation. Design, setting, participants, & measurements Web-based survey administered to members of the Canadian public, health professionals, and people with or affected by kidney disease asking questions regarding acceptability of strategies to increase living and deceased kidney donation and willingness to donate a kidney under various financial incentives. Results Responses were collected from 2004 members of the Canadian public October 11–18, 2011; responses from health professionals (n=339) and people with or affected by kidney disease (n=268) were collected during a 4-week period commencing October 11, 2011. Acceptability of one or more financial incentives to increase deceased and living donation was noted in >70% and 40% of all groups, respectively. Support for monetary payment for living donors was 45%, 14%, and 27% for the public, health professionals, and people with or affected by kidney disease, respectively. Overall, reimbursement of funeral expenses for deceased donors and a tax break for living donors were the most acceptable. Conclusion The general public views regulated financial incentives for living and deceased donation to be acceptable. Future research needs to examine the impact of financial incentives on rates of deceased and living donors. For patients with ESRD, kidney transplantation is the optimal treatment (1,2). Because of the increasing prevalence of ESRD (3), the need for transplantation continues to exceed the supply of transplantable kidneys (3,4). Donation rates from living and deceased donors have remained relatively unchanged over the last 10 years (3), despite strategies to increase the pool of transplantable organs by using expanded-criteria organs (5), unrelated living donation (6), ABO-incompatible transplants (7), and living donor paired exchange programs (8). Each Canadian province has its own human tissue and gift act (9) that prohibits the buying or selling of organs, and the current system of organ donation relies on the public volunteering their organs. Because the volunteer system is not meeting the demand, many strategies to increase donation have been proposed, including the use of monetary-based strategies, the merits of which have been fiercely debated. These include such strategies as reimbursement of expenses or lost wages for living donors, or the use of financial incentives that result in net monetary gain as a means of motivating donation (10–14). Previous surveys, with varying methods and populations, have been conducted to assess the feasibility and acceptability of financial incentives for increasing organ donation (15–30). Financial incentives have been implemented successfully to increase donation of sperm, oocytes, and blood (31); however, given legal and other concerns, the acceptability of financial incentives for organ donation to various stakeholders is contentious. The objective of this study was to determine the acceptability of the use of expense reimbursement or financial incentives by the Canadian general public, health professionals involved with organ donation and transplantation, and those affected by kidney disease. Further, we sought to determine whether financial incentives would change the willingness of the public to consider donating a kidney. We designed a web-based survey and administered it to three distinct groups: the general public (potential kidney donors) aged 18–59 years living in one of the Canadian provinces or territories, members of relevant health care professional associations, and people affected by kidney disease (Supplemental Material). Ipsos (32) electronically invited members of the general public who were included on their panel to complete the questionnaire during a 1-week period from October 11 to 18, 2011; the survey was closed to enrollment once the target enrollment in each age (18–59 years) and geographic stratum was achieved. For each health professional group, the questionnaire was distributed to members via email hyperlink on October 11, 2011, and two reminders were sent 10 days apart. To elicit the views of people with or affected by kidney disease, we placed a hyperlink to the questionnaire on the Kidney Foundation of Canada website and Facebook page from October 12 to November 4, 2011, inviting people to respond. This study was approved by the Institutional Review Board at the University of Calgary. The questionnaire was administered online to participants in English or French, Canada’s two official languages (Supplemental Material). We used two versions of the questionnaire. An abbreviated 22-item version of the questionnaire was administered to all participants and assessed the acceptability of financial incentives to increase deceased and living donor organ donation. A longer, 29-item version of the questionnaire given only to members of the public included additional questions assessing how a variety of financial incentives might affect their willingness to donate. Acceptability of strategies to increase deceased donation was determined by asking whether various types of financial incentives, in varying amounts (range, $0–$100,000), were acceptable. If participants did not find the strategies acceptable, they were given a choice of reasons to explain their rationale. Acceptability of strategies to increase living donation was determined by asking whether various types of financial incentives, in varying amounts (range, $0–$150,000), were acceptable. If participants did not find the strategies acceptable, they were given a choice of reasons to justify. The general public was asked supplementary questions to determine whether their willingness to donate would vary if they were offered financial incentives. Specifically, for deceased donation, the likelihood of joining an organ donor registry for monetary payment was assessed, whereas for living donors, their willingness to consider donating a kidney, while alive, for monetary payment was examined. Univariate relationships between the financial incentive acceptability (yes or no) and the three subgroups were described using descriptive statistics (number [percentage]), and a chi-squared test was used to test for differences in proportions between the public and health professionals. Because one concern regarding financial incentives is that people with lower income might be more likely to respond to financial incentives, stratified analyses were done according to household income. All analyses were done using Stata/IC 11.0 (Stata Corp, College Station, TX). Within 1 week of data collection, 2004 invited members of the Canadian public completed the questionnaire. Compared with the latest Canadian census data, respondent demographic characteristics were similar to those of the general population and were geographically representative. During the 1-month period that the survey was available to the health professional groups, 339 total responses were collected. Assuming that all people on the mail-out list were active members with a valid email address, the response rate for the health professionals was 19%. A total of 268 responses were collected through the Kidney Foundation of Canada for the group of people affected by kidney disease. Characteristics of the study population by group are presented in Table 1, including willingness to donate after death or while alive without any financial incentive. Of note, the majority of respondents stated they were willing to donate their organs after death, indicating strong support of organ donation. Around 71% of the general public, 66% of people affected by kidney disease, and 62% of health professionals supported one or more types of financial incentives to increase deceased donation. In general, all groups were most supportive of reimbursing funeral expenses (>45%), followed by providing a tax break or credit to the donors family. A monetary payment to the donor’s estate garnered the least amount of support (Figure 1). The majority of respondents suggested a tax break or credit value between $0 and $10,000. Acceptability of financial incentives to increase deceased donation (more than one choice of financial incentive acceptable). Approximately 16% of the general public, 32% of health professionals, and 23% of people affected by kidney disease found that none of the proposed strategies for deceased donation were acceptable. The most commonly cited reason was that a kidney should be donated from the goodness of one’s heart. Nearly 10% of the total sample of the public stated that giving a kidney should not involve any exchange of money as a rationale, although the rate of respondents choosing this answer was higher in the health professional group and people affected by kidney disease (24% and 18%, respectively). 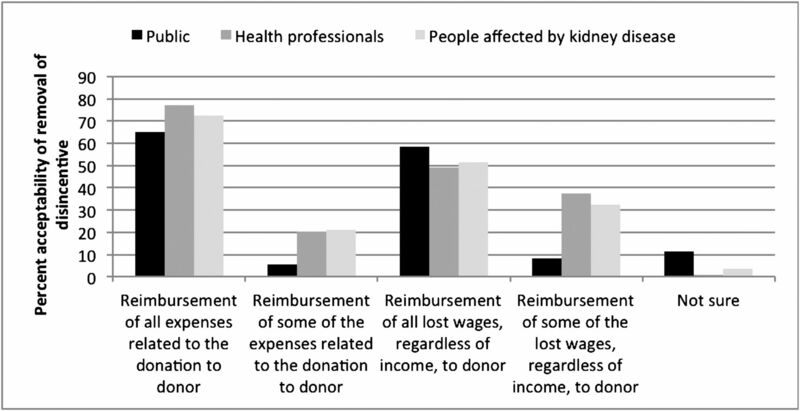 Support for acceptability of removing financial disincentives (i.e., reimbursing expenses) to living donation was strong across the three groups (Figure 2). Few respondents among the three subgroups found any of these strategies unacceptable (5.7% of the public, 2.7% of health professionals, and 1.1% of people affected by kidney disease). Acceptability of reimbursement of expenses or lost wages to living donors (choice of either all or some for both expenses and lost wages). 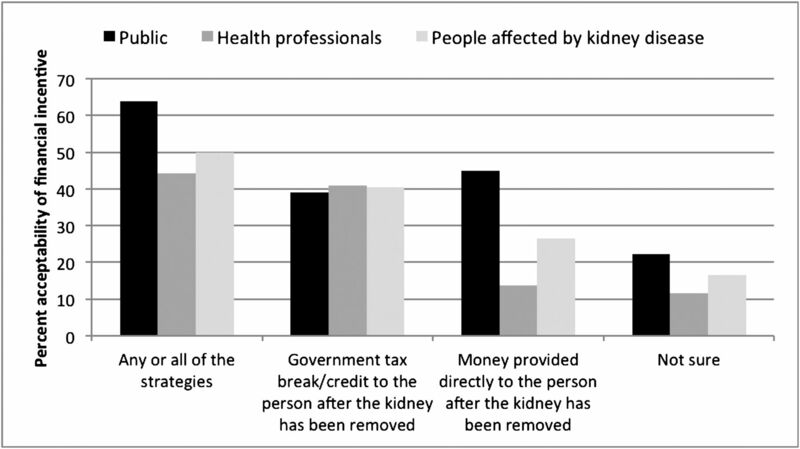 Overall, approximately 40% of all three groups found a government tax break or credit to a person once the kidney has been removed to be acceptable (Figure 3). Only 15% of health professionals found a monetary payment acceptable, compared with 45% of the general public (P<0.001). For those who supported incentive monetary payment or a tax break, a payment between $10,000 and $50,000 was found acceptable to the majority (>50%) of all groups; approximately 20% of respondents in each subgroup found a payment of $50,000–$100,000 acceptable. Acceptability of financial incentives to increase living donation (more than one choice of financial incentive acceptable). Nearly 45% of health professionals felt that a financial incentive in the form of a tax break or monetary incentive was not acceptable, compared with only 10% of the general public (P<0.001). Among the 14% of the public who felt that financial incentives were not acceptable for living donors, the most frequently cited reason among the public was that giving a kidney should come from the goodness of one’s heart (55%). Among the 44% of health professionals and 34% of people affected by kidney disease who stated that financial incentives were not acceptable, the most frequently cited reason was that giving a kidney should not involve an exchange of money (28% and 22%, respectively). Among the 1032 public respondents who reside in British Columbia and Ontario (the only two provinces in Canada with a deceased-donor registry), 56.7% said they were not aware of a registry for donors; 17.3% of respondents said that they had already registered their wishes. Almost 70% of those who had not already registered or were unaware of a registry stated that they would register with a new national government registry, without payment. Of the remainder (the 30% who said they wouldn’t register above), 89% would still not register, regardless of a payment. Among the general public who stated previously they would not consider donating while alive (405 of 2004), >50% (n=219) would consider donating to a relative for $10,000, and >60% (n=251) would consider donating to a relative for $100,000 (Table 2). This was more prominent among those who were previously unsure about living donation (750 of 2004): Almost 80% would donate to a relative, for $10,000 (n=591) or $100,000 (n=588). The greatest increase in willingness to consider donating to an acquaintance or someone on the waiting list was noted among those previously unsure, who would consider donating to an acquaintance or someone on the waiting list for a monetary gain of $100,000 (40% and 41% respective increase). Some people were not responsive to monetary gain. Of those who previously wouldn’t consider donating, 31% would still not donate for a monetary gain of $100,000, stating that giving a kidney should be from the goodness of one’s heart (n=48). Among those who were willing to donate without payment, a slight decrease was observed when payment was offered: Of those who were willing to donate without payment (n=663), 7% stated they would not consider donating for $10,000 and 2% would not consider donating for $100,000. When acceptability of the strategies for both deceased and living donors were examined by baseline income (<$60,000 and >$60,000), we noted differences in the preferred type of financial incentive. Forty-nine percent of those with lower income found a monetary payment to living donors acceptable compared with 44% of those with higher income (P=0.03). Conversely, 45% of those with higher income found a tax break for living donation acceptable compared with 34% of those with lower income (P<0.001). The likelihood of donating for payment also varied by income; among those who were unsure or were not willing to donate at baseline, 67% of those with a household income <$60,000 were willing to consider donating to a relative for a payment of $10,000 compared with 74% of those with a household income >$60,000 (P=0.01). The same trend was noted for a payment of $100,000, with 70% of those with a household income <$60,000 being willing to consider donating to a relative compared with 78% of those with a household income >$60,000 (P=0.01). Our study shows that the public, health professionals, and people affected by kidney disease view some regulated financial incentives for both living and deceased donors to be acceptable. Further, our survey suggests that the public may be more willing to donate while alive for monetary gain, potentially increasing the pool of potential kidney donors, if the public’s stated views translate into a behavior change. Although there was strong support for deceased donation, along with the reimbursement of funeral expenses and tax breaks as financial incentives for deceased donation, the public was generally unaware of and appeared unmotivated by deceased-donor registries as an incentive to increase deceased donation. Being aware of donation and finding alternative means to increase awareness (and thereby the potential pool of deceased donors) are imperative because current campaigns and registries do not appear to be having the desired effect—living and deceased donation rates have been stagnant in Canada over the last few years (3). All groups supported the reimbursement of expense and lost wages for living donors, which is consistent with current policy in most provinces, and there was consistent support among the three groups in acceptability of a tax break to a person after the kidney has been removed. There were differences, however, in acceptability of monetary payment for living donors by group, but not the value for financial incentives. The majority of public respondents felt that a value >$10,000 was acceptable; however, the health professionals generally felt that monetary payment as a strategy to increase donation was not acceptable, regardless of the amount. As such, it appears that it is not necessarily the magnitude of the financial incentive but the type of financial incentive that varies in acceptability. When examining whether the use of monetary payment would change the willingness of the public to donate, we found the percentage of those previously unwilling to consider donation who would donate for monetary gain was higher than the percentage of those who would no longer consider donating for monetary gain, resulting in a net effect of more potential donors when presented with monetary gain. The resistance to consider living donation or the loss of potential donors, despite a monetary payment, could reflect people who would not donate under any circumstances or are put off by the offer of money to donate. Barriers to living donation have been examined previously, and financial disincentives are but one barrier noted. Increasing the pool of potential living kidney donors may require use of several incentives, including financial ones, to maximize the pool of potential donors. Further, careful evaluation on the impact of all potential donors would need to be considered during a pilot of such a program. Our results echo the findings of previous surveys, including a few done in the United States, which have noted that financial incentives could increase the proportion of nondonors who would be willing to donate, while living or deceased, when an incentive is offered (15,16,18,21,22,24,29). Similar to our study, these studies have noted that the majority of the public views many of the financial incentives as acceptable, whereas health professionals working in the field of transplantation and nephrology are much less supportive. Surveyed health professionals in transplantation have suggested previously that providing incentives to the family or potential donor may increase the number of potential donors (20,27) and found similar support for financial incentives similar to those studied here (28). The lack of acceptability of certain financial incentives, notably monetary payment, by health professionals may stem from their comfort level in discussing donation with families once financial incentives are offered (33) or their perceived “moral inappropriateness” of offering cash (20). Further, it is interesting to note that whereas a tax credit is akin to monetary payment in terms of value in this survey, there were notable differences in preferences for the two forms of financial incentives across the different groups. Proponents of incentives point to the long-standing and successful practices of payment for blood, blood products, sperm, and oocytes (34,35). One theory states that incentives alone may not motivate donations but may tip the balance by lowering perceived societal costs (perceived barriers to donation) (35), acting as a prompt for those who are inclined to donate but have not taken action (36). In oocyte donation, donors cite both altruism and financial compensation as reasons to donate (34), and assuming that incentives obliterate all altruistic motives is undoubtedly too simple a picture for human behavior (37). Altruism can be defined as “the doctrine that each of us has a special obligation to benefit others” (38) and supports the current organ donation system of volunteers, or exhortation, where potential donors are urged to donate. Given the plateau of donation rates, further increases in the supply of kidneys in the current system are unlikely. Financial incentives may be one strategy to appeal to those who don’t respond to exhortation such that they proceed with organ donation. Opponents of incentives argue that a system with financial incentives will replace all intrinsic motivation with material motivation (35), challenges ethical constructs of the commodification of the human body (39), and is potentially exploitive (37,40). Although it is not possible to determine through a survey whether incentives will exploit the poor, the results herein are consistent with those of other studies (19) and indicate that persons in lower-income households are less willing to consider donating for $10,000 or $100,000 compared with those in higher-income households. A system of financial incentives where the government is the payer (as outlined in our survey) might not discriminate against the poor given that it is available to everyone equally, on both the supply and the demand side, unlike a market in which only those with more disposable money can afford a kidney. It is speculative to predict exactly how potential donors will react to financial incentives and whether incentives will bring forward a new pool of potential donors, or conversely, whether any potential backlash would limit the current pool of donors stepping forward. Although not all potential donors may respond to monetary payment, we believe that on the basis of these results, the public finds financial incentives acceptable enough to proceed with a pilot trial. This pilot trial, in addition to determining the extent to which monetary payment brings forth potential donors, needs to formally assess the reaction of the public to such a program more broadly. Our study has limitations. Because the survey was distributed electronically, it was limited to those with access to a computer and the Internet, although the anonymous nature of responding may avoid any social desirability bias (41). The electronic nature of the survey might not bias the results of health professionals, but it may limit the generalizability of the responses from the public and those affected by kidney disease. However, our sample of the public reflected the Canadian general population as identified through census data, including education and employment status. It is possible that because of the lower response rate of the health professionals, our sample may not be entirely representative of the broader group of health professionals. We recognize that the results reflected in this study do not measure actual changes in behavior: that hypothetical willingness to donate may not translate later to real decisions, and donations may not increase with financial incentives. This may be truer in the case of payment to living donors because it involves a risk to the individual, and it is not known how surveys can predict behavior change where risk is involved. Further work needs to be done to clarify the unacceptability of financial incentives among health professionals, as they are a key stakeholder in the organ donation process. Engaging them in the process should financial incentives be incorporated into the organ donation system is critical. In the interim, these results can inform health professionals that financial incentives do not appear to deter the public in their willingness to donate, which may alleviate some of their discomfort. Much of the focus in discussions of financial incentives for organ donation has been directed to ethical implications and speculation of impact on current practices. Our intent in this study was to examine the acceptability of the various financial incentives from the perspective of the public, health professionals, and people affected by kidney disease. Our findings demonstrate that the acceptability of financial incentives to increase the number of deceased and living donors differs for the public, health professionals, and people affected by kidney disease, with the majority of the public seeing financial incentives as largely acceptable. Future research in this area should focus on the determination of the impact, effectiveness, and cost-effectiveness of financial incentives on donation rates. This study was funded by the George and Kay Goldlist Family Foundation. L.B. is supported by an Alberta Innovates–Health Solutions Trainee award. S.K. and B.M. are supported by Alberta Innovates–Health Solutions (formerly Alberta Heritage Foundation for Medical Research) career salary support awards and are also supported by an alternative funding plan from the Government of Alberta and the Universities of Alberta and Calgary. The funding organization had no role in the conception, design, conduct, analysis, interpretation, or reporting of the study, and none had access to the data. This article contains supplemental material online at http://cjasn.asnjournals.org/lookup/suppl/doi:10.2215/CJN.04100412/-/DCSupplemental. See related editorial, “Removing Financial Disincentives to Organ Donation: An Acceptable Next Step?” on pages 1917–1919. Human tissue and organ donation act. Statutes of Alberta. Chapter H-14.5; 2009. Removing Financial Disincentives to Organ Donation: An Acceptable Next Step?